Sangiovese is an Italian red wine grape variety that derives its name from the Latin and means “the blood of Jove”, referring to the Roman god of Jupiter. Historically Sangiovese has held a prominent place in Italian winemaking and was already well known by the 16th century. Sangiovese is well suited to the climates of Central and Southern Italy as it requires a long growing season since it buds early and requires sufficient warmth to fully ripen. But, if it gets too much heat, its flavours can become diluted. A typical Sangiovese is light in colour and has a flavour profile of sour red cherries with earthy aromas and tea leaf notes. It will have medium tannins and high acidity. If it is made with oak, it will readily take on oaky flavour. Sangiovese is usually made to be consumed with minimal aging. In Italy, the most famous Sangiovese wines are made in the Chianti region of Tuscany and are simply called “Chianti”. 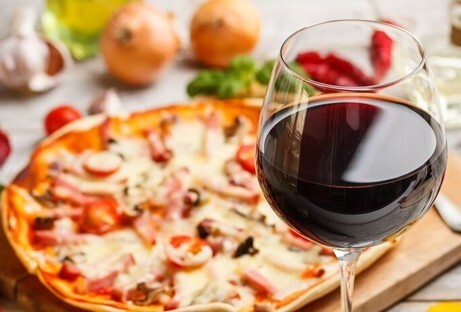 The classic Sangiovese pairing is Italian style Pizza. The high acidity in the wine makes for a match made in heaven when the pizza is smothered in rich tomato sauce. Cover the sauce with mozzarella and sprinkle with fresh basil to play off the herbal notes in the wine. Sip your Sangiovese and nibble your pizza while enjoying your favourite movie or TV.